In 2012, subcontractor and mouldmaker Norjon Engineers more than doubled the size of its factory in Gosport to 14,000 sq ft, following a 60 per cent increase in turnover the previous year. Four years previously, owner and managing director, Kevin Fox, bought two 5-axis Hermle machining centres, both C 20 Us with 600 x 450 x 450 mm working volume, to produce aluminium and brass thermoforming moulds. They are supplied to the food industry for the production of plastic packaging such as yoghurt pots, food trays and disposable cups and lids. 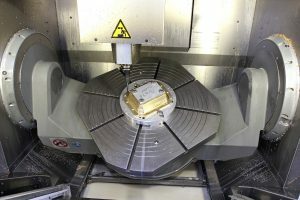 Component sizes started to increase, requiring the purchase of two larger 5-axis machines. Mr Fox opted for two Hermle C 40 U models with 850 x 700 x 500 mm travels. One has an 18,000 rpm spindle commensurate with the high proportion of aluminium machined, while the other has a 10,000 rpm, high-torque spindle for heavier cutting of steels and harder materials. Surface finish is important, as good cosmetic appearance is a prerequisite for plastic packaging in the consumer industry. The finish of the Hermle machines is described as superb, so Norjon does not have to hand-polish the moulds after machining. Rapids of 45 m/min and an 18,000 rpm spindle ensure fast cycle times, while the robust rotary table and trunnion arrangement with its bearings set directly into the mineral casting that forms the bed, ensures that tight tolerances are held. This is the case even during full 5-axis machining of deep features with steep draught angles. Other work at Gosport requires machining of aluminium-bronze and Duplex to produce seals for a customer in marine propulsion. The yachting, printing, energy, motorsport, aerospace and medical industries are other regular users of Norjon’s services. Some tolerances are extremely tight, exceptionally down to 2 microns total, while 5 microns on some oil and gas parts is routinely held. Kevin Fox, Owner and Managing Director.